Catrice sure knows how to excite, gain new buyers and stay in trend with every passing seasonal release. I'm not gonna lie, I'm definitely in the group of crazy ladies that's always on a hunt after new, freshly released Catrice bits. This Fall season around, I was not as intrigued with usual lip products as I'm excited over face products. Who would have thought, that a lipstick junkie like me would break under the pressure of having an overflow of lippies. After initial impressions, it's safe to say that Catrice face (and eye) novelties for Fall/Winter 2015 are worth the extra look. Defining Blush (3,79€, 5g, here) range had to grow on me, that's for sure. Initial shades and colours were just too bright for my personal taste but I'm happy to see that's slowly changing. 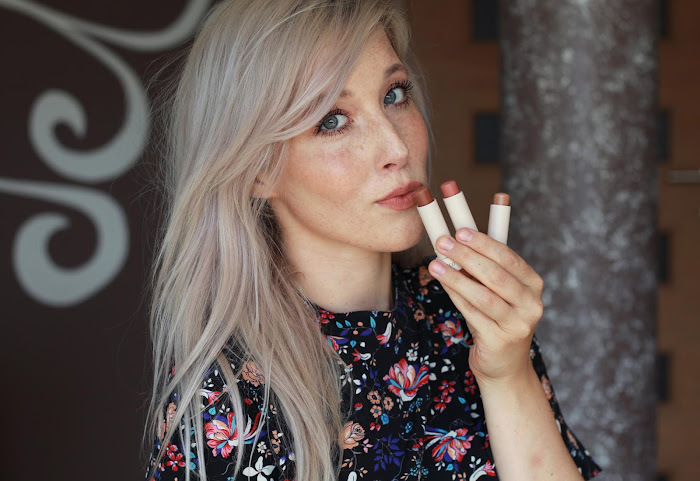 In fact, along with perfectly light discontinued shade called Pink Charming (pastel peachy pink), there are 3 newly released shades, 2 of them are especially perfect for pale ladies like me. 045 Lilactric is a brightening, white based pastel violet that shows up only on extra fair complexion. Medium and tan skintones could use this as a cool highlighter. It's so light, that it can be easily compared to a long gone favourite Dainty Doll Blusher Hippy Shake by Nicola Roberts (I still regret the day they've discontinued her makeup line for pale girls). Staying on the track with Catrice, Lilactric is actually satin with an extremely sheer pigmentation. Building the shade intensity is easy though. Texture is finely milled and easy to apply in layers. If you prefer pigmented blushers over layering, this is a definite pass for you. On the other hand, 100 Rose Couture is a neutral rose in a similar colour family as Tarte Exposed (but way lighter) or Benefit Hervana. Veining silver shimmer and sparkle add a bit of glow without over exaggerating your pores. I actually love it since it's not too warm yet not too cool - wearable with any lipstick shade. Smooth texture and possible sparkle fallout are the two things to remember. Defining blushes have an average longevity of 4-6 hours. Catrice Liquid Camouflage High Coverage Concealer (3,79€, 5ml, here) sounds as a perfect European version of UK's beloved Collection Lasting Perfection Concealer. High coverage, water proof consistency and ability to cover tattoos/scars/pigmentation are the main selling points. Well, it kinda sounds too good to be true, right? Coverage is in fact quite good, however only to medium extent of pigmentation. It doesn't cover obvious marks nor tattoos (read Petra's take) but it manages to cover imperfections such as blemishes and lighter pigmentation marks. Consistency is buildable and thick with floral scent to it. Thick but creamy formula tends to set nicely but still exaggerates obvious lines or pores. Although it's not the best around T-zone area, it blends easily even under the eye area. It covers dark circles and it's still not too heavy. Personally, I really enjoy using this concealer but it still can't compete with UK's Collection Lasting Perfection. Shade 010 Porcellain is light enough for fair skintones (NW15 or Bourjois Healthy Mix 51 in my case) and it doesn't have prominent yellow tones as most concealers. Demo is made over my hand where I've burnt myself and got extra hyperpigmentation with time. Clearly, it conceals most of my freckles while the most prominent still shine through. Recommend! Velvet Matt Eyeshadow (4,29€, 2,9g, here) are pretty pricey for Catrice range, however, the actual eyeshadow is superb in texture, finish and pigmentation. They are highly, highly pigmented with the most stunningly smooth texture and velvety finish. Name might mislead you as the shades itself aren't totally matte. They are all in the range of satin or sheen finish. The main mistake, sensitive baked bump of eyeshadow is now transformed into flat surface, making the actual amount drop from 3,5g to only 2,9g. Still, I enjoy my older versions so much, I had to try newly added shade in Princess Mattleine. It's a gorgeous tan neutral (or should I say ''bronzer for your eyelids'') that can fit into the crease, as an all over colour or warming shade. Satin colour with a slight sheen is actually a bit more matte looking on the eyes. I love to pair it with a winged liner as an all over lid shade or adding extra warmth to my crease. They have a good lasting power without fading through out the day while you will silently squeal when you'll touch the velvety smooth texture. I've had another blast with new Catrice Fall/Winter 2015 products. I'm still eyeing some other bits (Contouring Palette for example) but I'm also totally happy with my current picks. If the foundations also have a new, more pleasant scent and lighter shades as the mentioned concealer, I might give another try with them too. Velvet Matt Eyeshadows are expensive but worth the try, while Defining Blushes are a no brainer. Liquid Camouflage Concealer is a lovely medium coverage concealer that shouldn't be missed out in daily makeup routine. Catrice is, all in all, still on fire with trendy colours and textures. 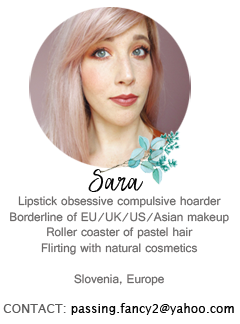 Catrice can be found in most European drugstores (Catrice is also newly available in the USA - Ulta stores & online) and it's widely available in Slovenian drugstores such as Muller, DM and Tuš drogerija. Tudi mene odbija vonj pudrov, upam da so ali bodo spremenili vonj v smer tega korektorja. Sem bila kar razočarana ko sem prvič videla ta dva blusha v živo. Pričakovala sem da bosta temnejša in bolj pigmentirana, sploh Rose. Korektor sem si tudi želela, ampak ko sem ga preizkusila na roki mi je takoj zelo oksidiral. Raje nisem tvegala potem, čeprav odtenki so v redu.